I'm taking a little break from the sail documentation to show and tell you a little about the frame and parts that will come after the sail is complete. 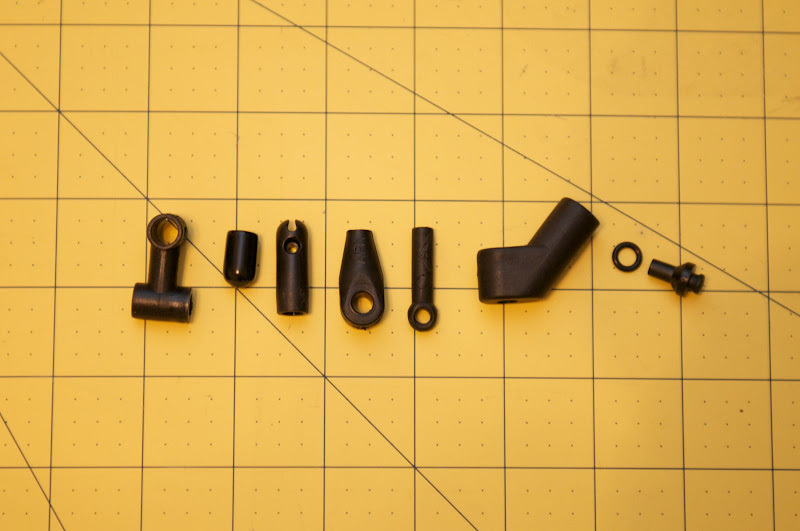 The first picture is a collection of the fittings you'll need to put the frame together. (note that these are my choice of fittings and not the only options.). 1. R-Sky center T, 6x7 (We'll talk about this more later). 3. HQ end nocks, to fit 6mm carbon ferrule. 4. APA standoff connector (actually to be used at base of spine for this project). 5. I believe these are Jaco standoff-spreader connector... many (probably most) use APA standoff connectors, but I prefer these as they are slightly less bulky. 6. APA leading edge connector (I use size CA). 7. Jaco 3mm standoff to sail connectors (with 'O' ring). I have not used the screw-to-sail style common on R-Sky kites, but may in the future. If these Jaco parts are good enough for Ken McNeil, Jon Trennepohl, Paul Shirey and others, they're good enough for me. next picture is my frame of choice (and mostly what is recommended by Werner at the B'zar website). 1. Solid 6.1mm carbon rod for making Ferrules (not shown in previous pic). 2. Pultruded 6.1mm carbon rod (hollow) for upper spreader. 5. 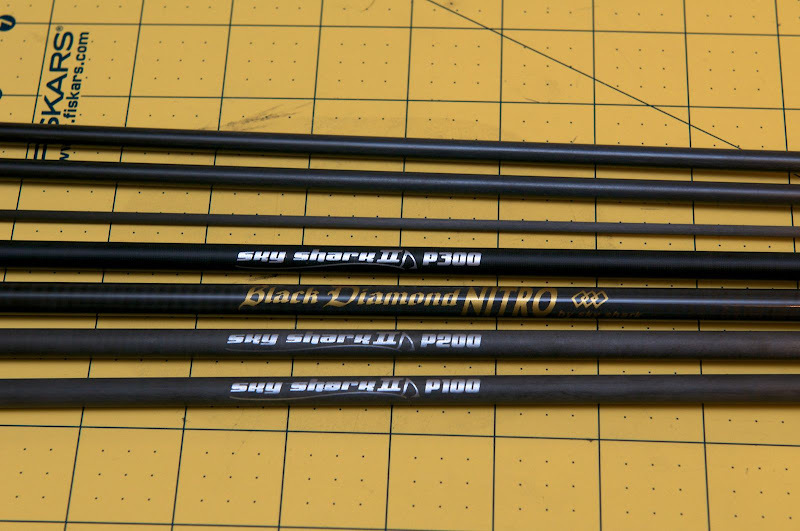 Skyshark Nitro Strong (gold label) Black Diamond. You'll need 2. These rods cost as much as $20 (I believe Steve sells for $18), so measure twice and cut once when we get to that section of the build! 6. Skyshark P200 for leading edges. 4 needed for this kite. One last pic for this post. I purchased some excellent leading edge material from Paul Shirey when he sold off his supply of kite material... The material is Mylar coated Taffeta ribbon. 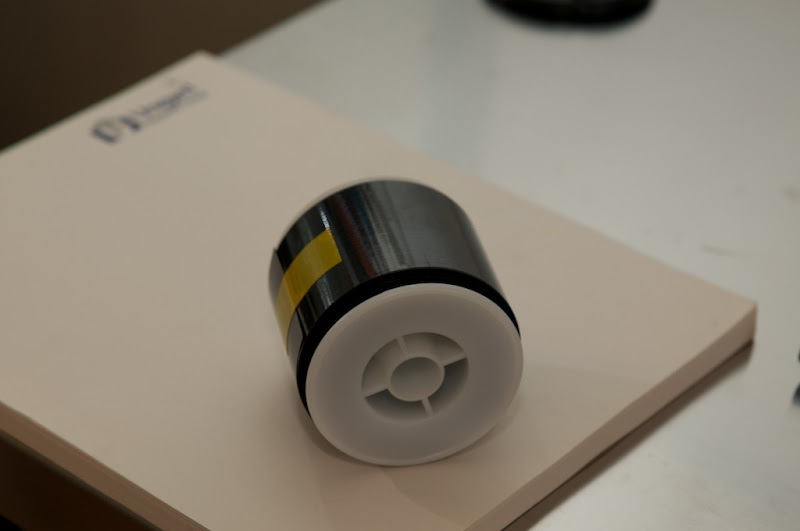 It is basically 2" dacron tape but coated with mylar on one side. I've seen it on Paul's kites and on some of Lam Hoac's kites from a few years ago. My understanding is that it is not available anymore... or at least very difficult to find. I purchased 40 yards from Paul, and this will be my first time using it in a build. 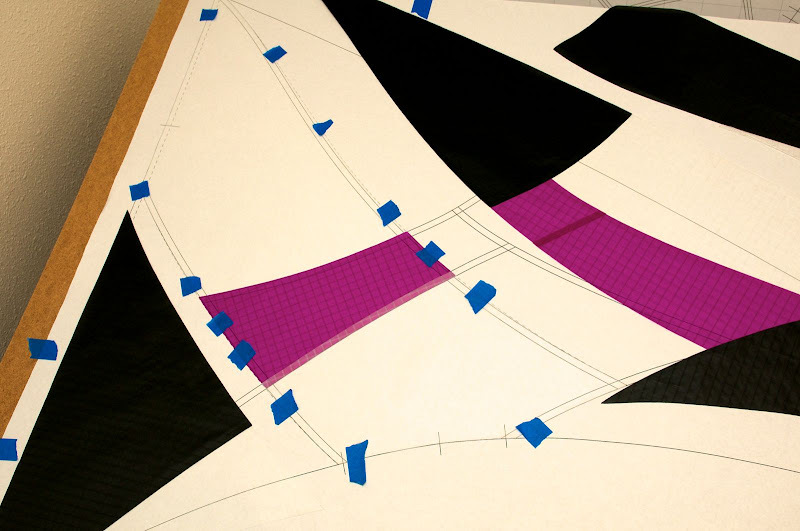 so, at this point, I've finished cutting the sail panels, and am ready to secure my seams for sewing. Besides the fabric and a full size plan mounted to a hard board, you should have something to attach the panels to one another. 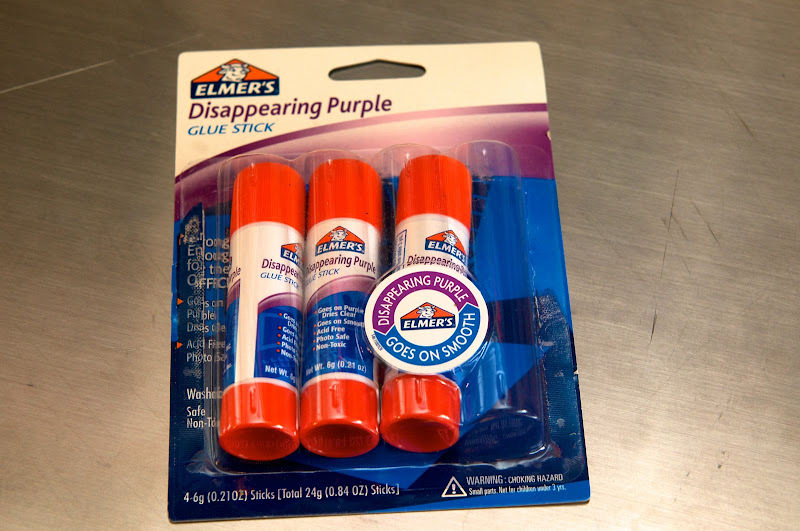 My preference is an inexpensive Elmer's glue stick (I use the kind that is purple... but dries clear). 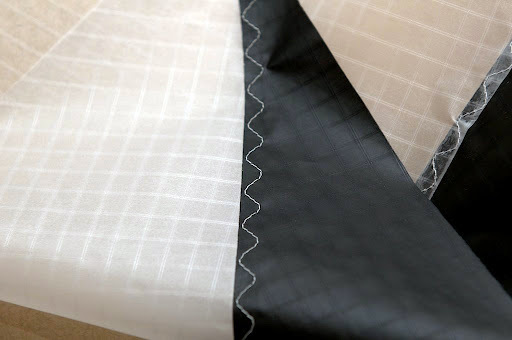 I have used seam tape in the past and find that for curved seams it is difficult to place without creating wrinkles. 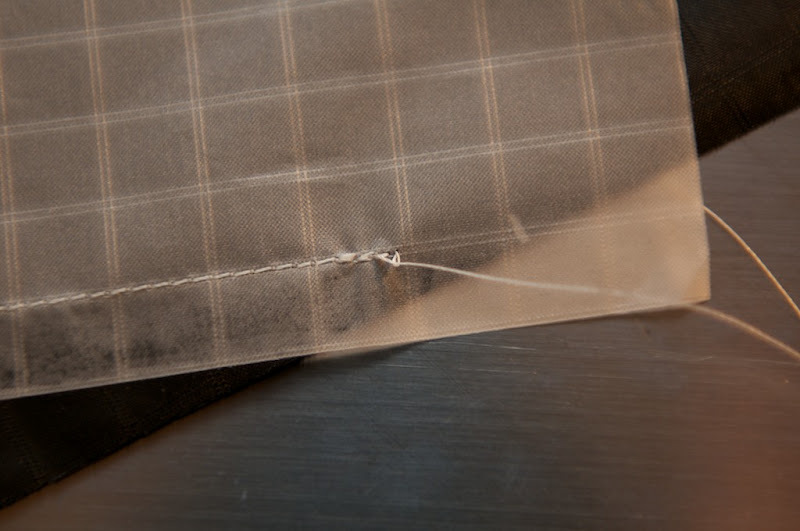 In addition to wrinkled seams, I find that sewing through the seam tape causes my machine to get gummed up and work less efficiently (with the occasional broken thread). Additionally, I use blue masking tape (generic, purchased from local hardware store) to hold the panels to the plan while glueing. 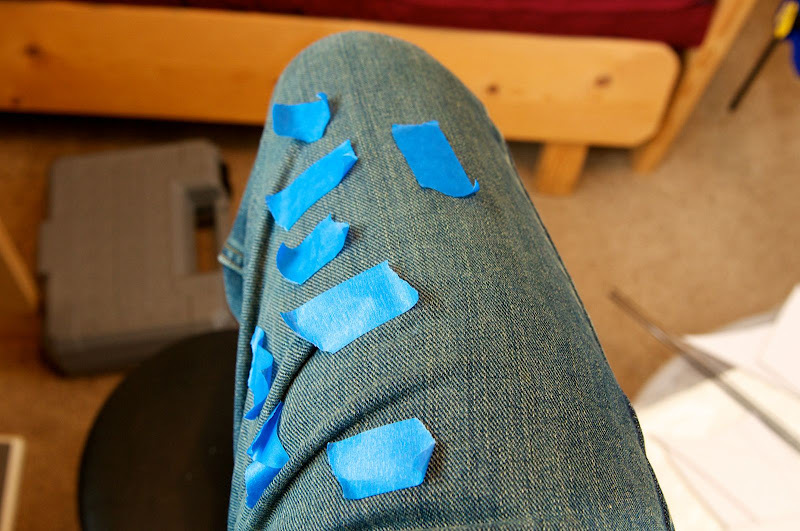 Before laying out the fabric, I tear off approximately 15-20 pieces of tape and stick them to my jeans or other clothes items. 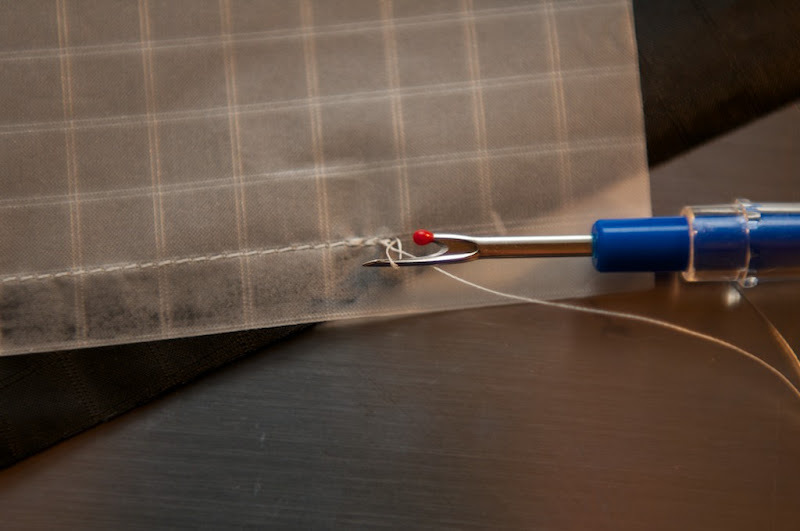 This make them slightly less sticky for easy removal from the plan paper and fabric. The sail should be glued in stages... right half, then left tends to be my natural progression, but more importantly is how you glue the individual halves. Starting with the right half, I place panels B, F, E, I and J on the plan. Static keeps the panels in place for the most part, but I also use tape to hold them. 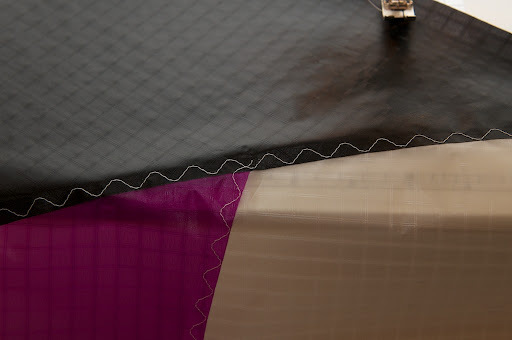 You'll notice that these panels are connected at seams that do not affect the billow of the sail... no dashed lines at connecting points yet. Alignment is critical at this during these steps. 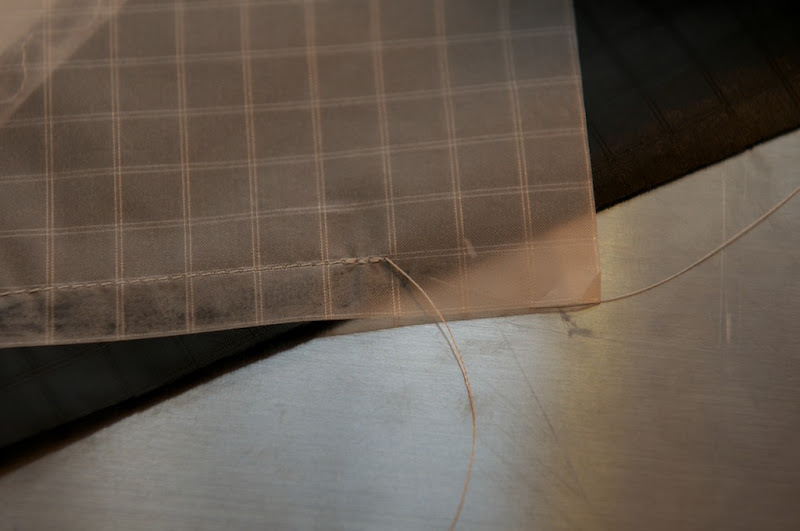 All the seams are important, but the most critical are the edges that form the leading, trailing and spine edges. 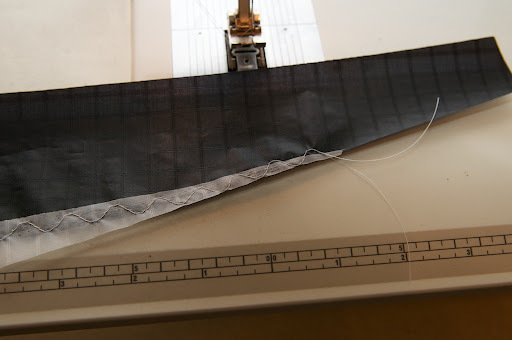 secondly (and equally as important are the edges that will connect to the billowed portion of the sail. Be sure to glue the darkest colors on top of the lighter colors for this half of the sail. 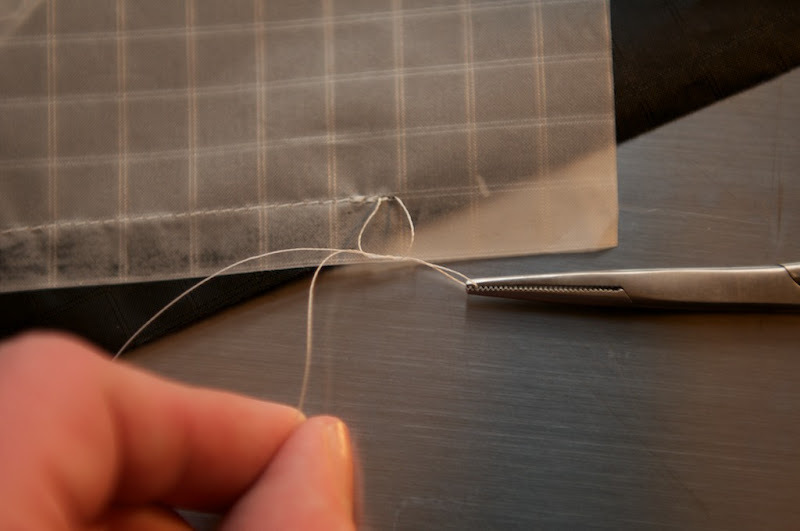 Place enough glue to stick, but try not to have clumps, as they could cause wrinkles later while sewing. Get plenty of glue coverage... the entire width of the seam if possible. Next, place and glue panels C and G. This seam is also not a portion of the billowed connections. After these two portions (of this half) have been glued and dried, slide them out of the way and place panels A, D, and H on the sail. At this point, they should lay flat and line up with the dotted lines on the plan. We are NOT attaching them to the already glued portions... only to one another. See pictures. 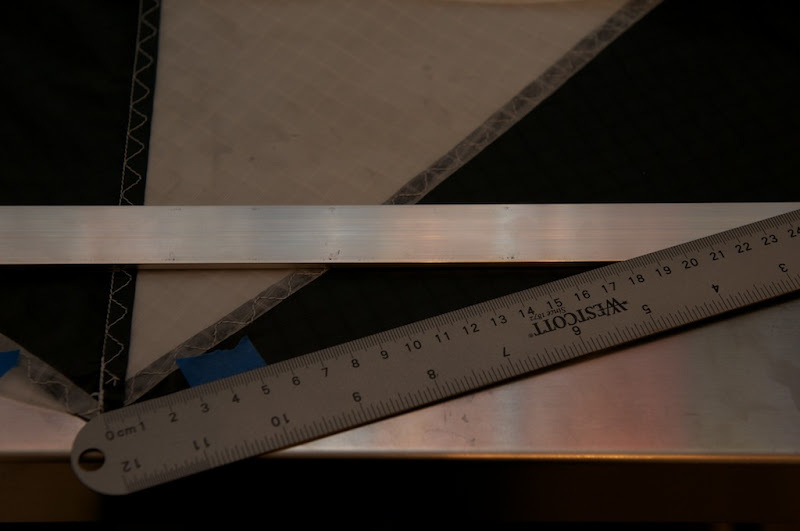 Now, there should be three portions of the right half glued up... 1. the leading edge and tip, 2. the tail portion of the trailing edge and spine and 3. the middle portion of the sail that will be the bulk of the billowed area of the sail. Tomorrow I will post my method for glueing up the billowed portion with accuracy. As for every step, pictures and explanation will be included. ok. It's 2:30 a.m. and I can't sleep (I work nights, so often I am up at this time). Lets see about prepping the rest of the right half of the B'zar for sewing. to recap, the right half of the kite has been glued into three portions distinguished by their relation to the billow of the kite. All that remains is to connect the uneven seams at the middle of the sail. The way the billow is made possible is that the middle panels have been cut with a longer edge then the outer panels. 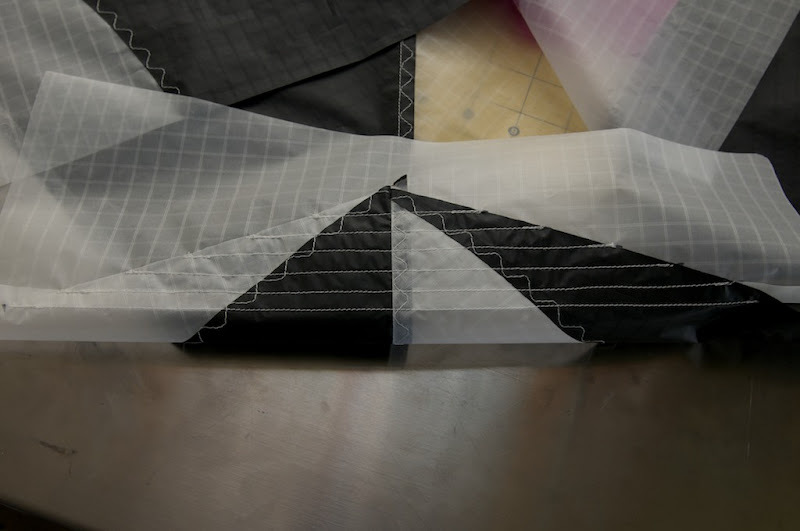 Then, when glued up to the shorter seams (using the same amount of overlap as the rest of the seams), the longer panel forces the fabric to curve (concave or convex depending on whether the sail is loaded or in a stall). The way I've found that works the best is to tape the middle portion to the plan/board along the solid line representing the final glued position. I start with the longer of the seams (seam closer to the leading edge). See the picture to understand what I mean; you'll see that there isn't much difference between the dotted line and the solid one, but this will be enough to put a curve to the fabric. Use lots of tape so that it is as even along the line as possible. 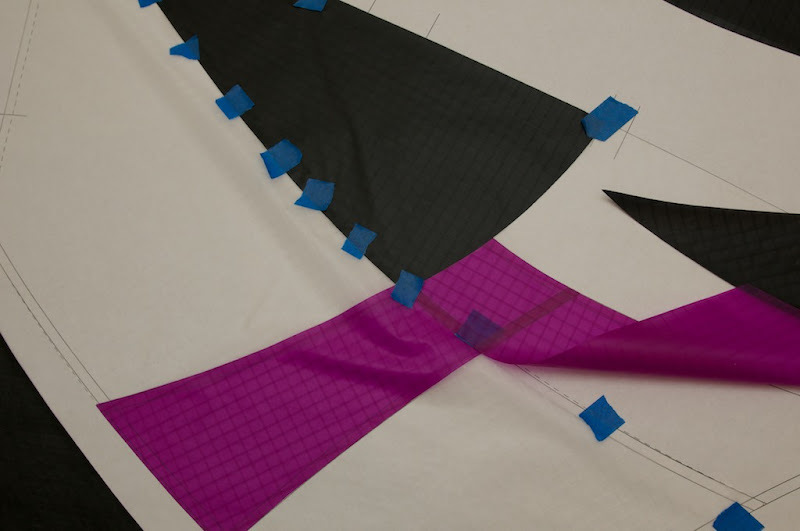 Once the middle portion is taped to the plan, move the upper portion of the sail into position and tape it so that it matches with the outer perimeter of the kite. place glue on the panels at the back of the kite... in this instant glue is applied to the middle portion of the sail. Working my way from nose to trailing edge, I glue the upper sail portion in place while systematically taking away the tape... and replacing it over the now glued seam to hold it in place. 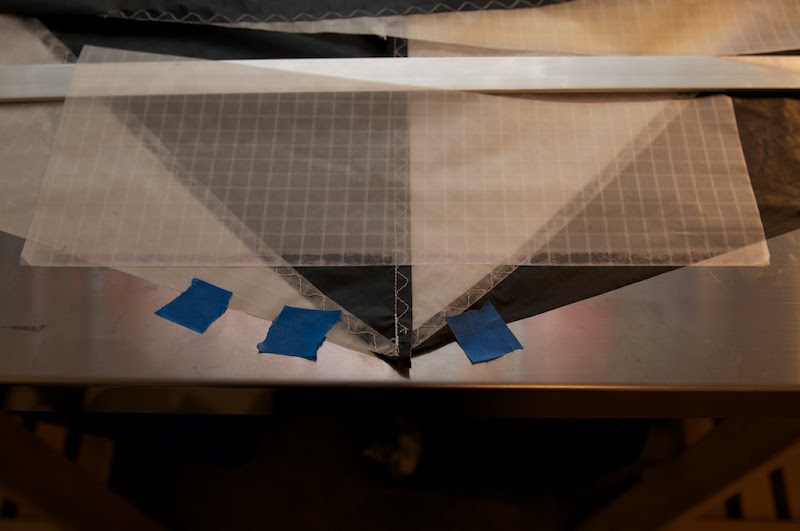 Once the entire seam is glued and taped, I place a spar under the sail to hold a small amount of loft to relieve the stress points in the seam. Then I leave it for an hour before I move to the next seam. 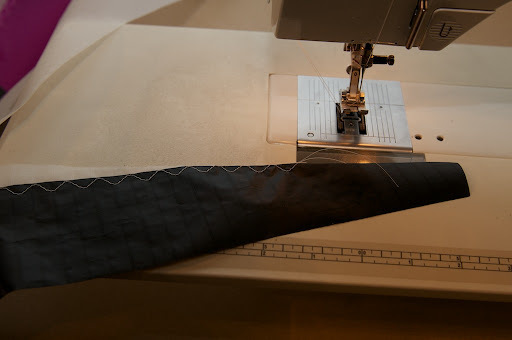 The lower seam is attached the same way, and left to dry in the same manor. The billow can be seen in this pic, wrinkled, but present. The sail will not lay flat on the working surface at this point. Be sure your seams are dry before removing tape. An hour should be plenty of time to wait. Even when the glue is dry, the seams will be fragile, so be careful when transferring the sail from work surface to sewing machine. Edit/Addition If you have read ahead of this point in the thread, you'll note that the original publication/post shows that I had forgotten to glue the mylar reinforcing panels to the back of the kite prior to sewing. (panel H in our diagram). Because I forgot to glue it on and because I still wanted the strength of the mylar in the sail at this stress point, I attached these panels using a 2x2 zig zag stitch that can be seen in the following pictures. I caught the mistake early enough that the left side of the sail could have been completed properly, but I want the kite to by symmetrical... so I purposefully did the same order of construction on the left. In the future I will do my best to avoid this. Here are pics of the front and back of the sail now that the mylar has been added. Hopefully by adding this portion (edit of this post) you can avoid the same mistake. Now you can proceed. so the right side is glued up and ready to sew. since this is not your first kite build (remember I've said that a few times), I'm going to assume that I do not need to go over things like "how to thread your sewing machine" and "this is how we avoid sewing through our hand"; if either of these topics are causing you to scratch your head, stop now and take a look at the resource thread at the top of this portion of the forum. 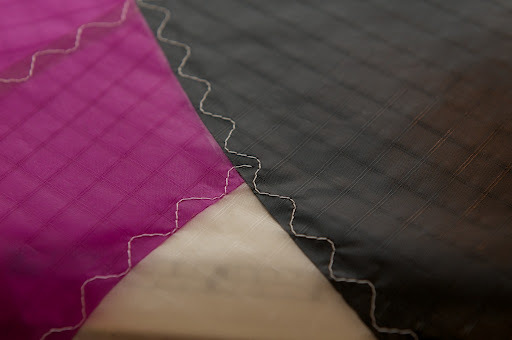 Other choices to be made prior to sewing are what stitch you prefer. 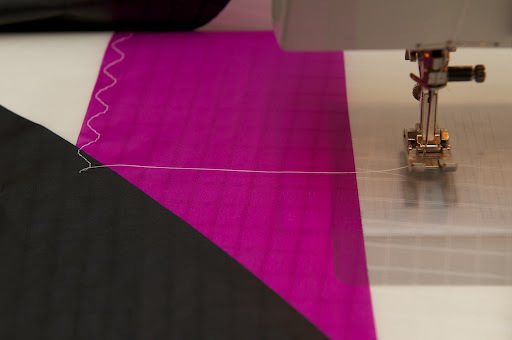 Easily the most popular stich pattern used in kite making is the 3 step zig zag. This works perfectly fine and is often the best choice. My selection (which may only exist on Bernina machines, I don't know) is a serpentine pattern that closely resembles the zig zag stich, but flows a little nicer visually... in my opinion. See pictures for example. My particular settings for width and length are 5x2 (this is in millimeters on my machine). 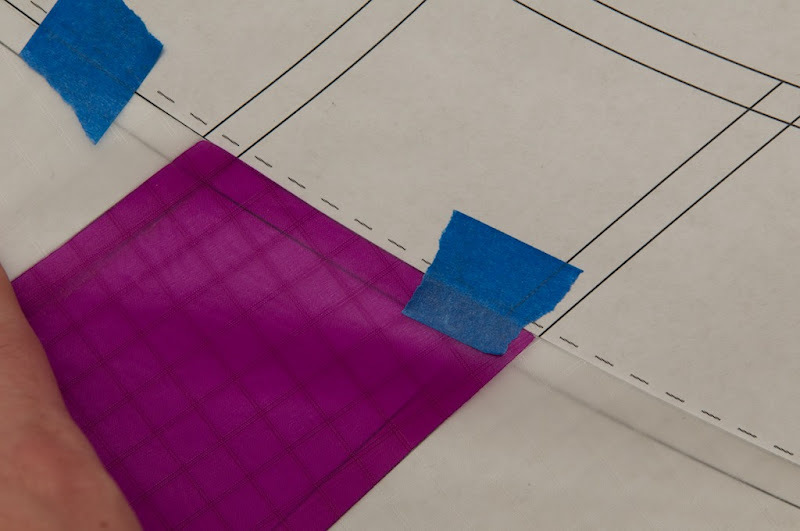 Choose your width to fill as much as the seam overlap as possible without going over. Note that the serpentine stich is less forgiving (visually) than the 3 step zig zag, as there are more stitches made at the edge of the pattern and going out of your desired stitching zone will be more obvious. As far as needle selection, there is plenty of debate on what is the best. Truth is, I haven't changed my needle in 4 or 5 builds and don't even remember what is in the machine... probably a #12 universal. I find that I get even tension, visually appealing stitches, and few stitching errors so I don't have any reason to change. The picture here shows that I am using the generic foot that is standard with my machine (I have approx 12 other choices but rarely use something else). I like the generic foot, as I use the widest setting it will accommodate, which gives me some easy visual landmarks. Using visual landmarks to maintain my stitch line has always worked better for me than trying to use fancy machine attachments or different feet. Use what you like. 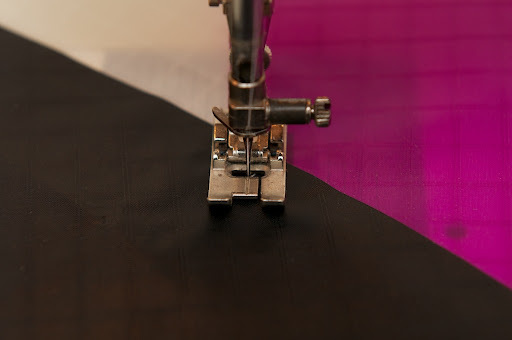 The second picture shows that I'm able to set my machine to stop in a needle-down position. This is important if you ever intend to raise the foot/manipulate the fabric prior to the end of a stitch... helpful in applique and sewing around corners. This is not so critical in this portion of the build, but will be useful when sewing the nose and other fortifications. So, I'm going to include a few pictures... they come in no particular order. When sewing your seams, it is important to check your bobbin to make certain you have enough thread (don't want to run out half way through a seam... ). 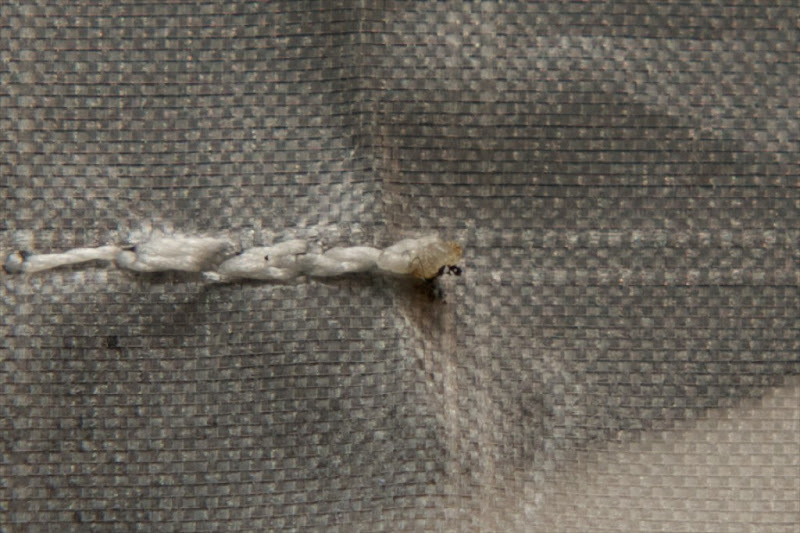 As a reference/guide, I was able to stitch both halves and the seam connecting them at the spine on one complete bobbin's worth of thread before I decided to reload it. This first pic shows a couple of things. note the amount of thread I pull away from the machine when I finish a stitch. This allows me to cut the thread and leave enough to tie off the stitch, and enough that the beginning of the next stitch I sew will have threads long enough to tie. It's way easier if you have too much than too little when tying off. The second thing pictured here is how far into the adjacent seam I sew. The idea is that when stitching the perpendicular seam, you'll cross over the end of the first one. This adds a small amount of security should the first stitch ever come loose at the end. The next picture shows the front and back of one seam. 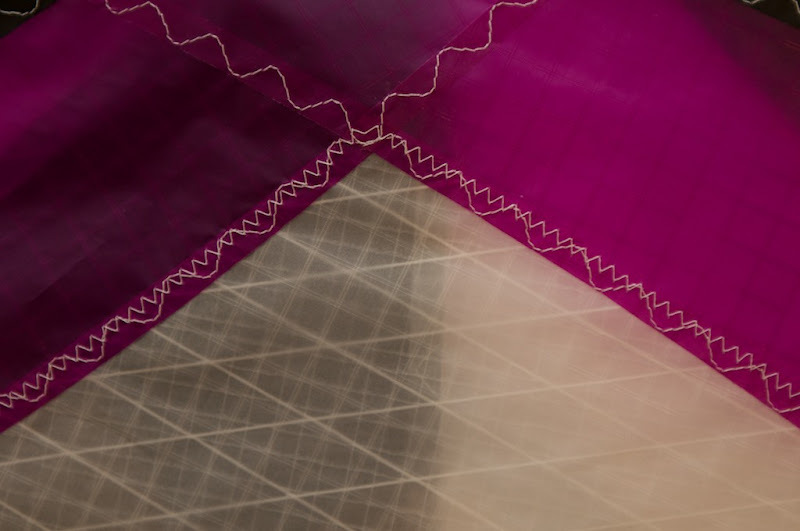 Note how evenly the stitch runs at the edge of the seam overlap, on the front and back of the kite. 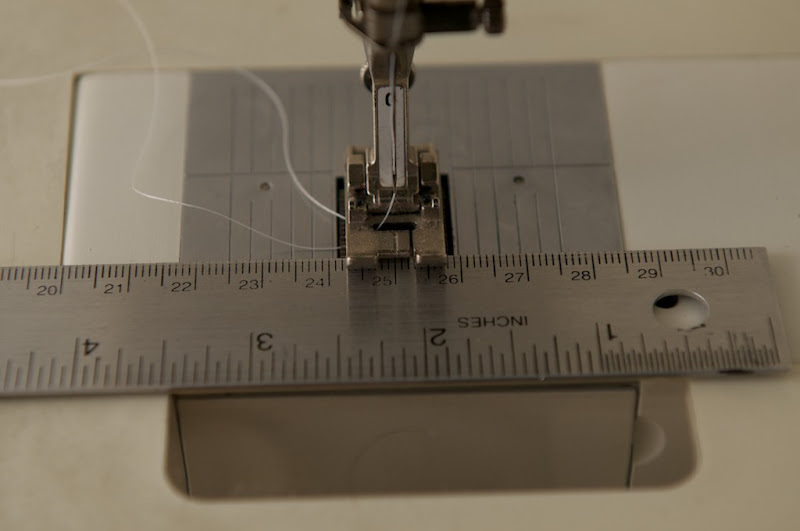 If you're worried about the tolerance and how the stitch will look, choose a stitch width that is slightly smaller than the seam... it will give you less coverage over the seam, but will look better in the end than if you stitch outside the seam overlap. These last two pictures show where the two panels at the wing tip come together (panels F and J from the previous reference). The first pic (shows front of kite) looks like I came to the edge and then sewed too far... you'll notice on the second picture that by doing this, I've secured both panels completely. Another important thing to remember is that this portion will be underneath the leading edge material and never seen once the kite is completed. Some of you may be wondering how I finish off the individual seams... what I do with the loose threads. I'll have some detailed pictures coming up with explanation of a surgeons knot and a step that could burn a hole in your beautiful sail (don't play with fire, and don't get mad at me if you burn a hole in your kite... which I have done before, it's not a way to improve your day!). 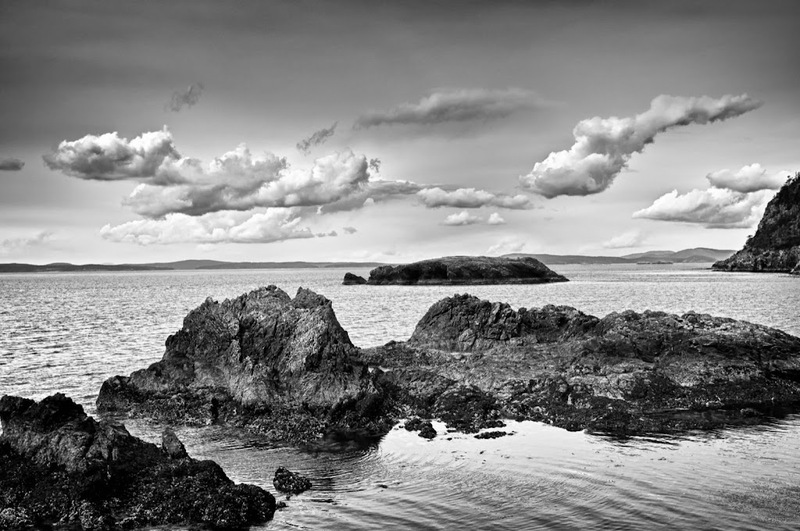 And if the previous pictures were not enough visual bliss for the day, enjoy this picture of Deception Pass State Park in Washington state. Photographed by me just over a week ago. Pause for just a moment. Is something missing? If you are building along with me, I have been up front with you from the start... mistakes might be made. Is this a drastic mistake? No. Can it easily be avoided by keeping your work space organized? Yes. Didn't I warn you to have an organized workspace? Yes. 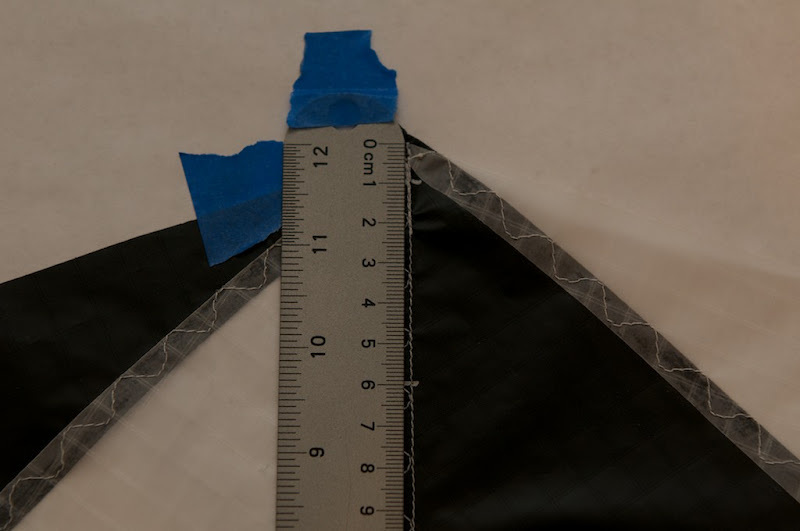 Here it is: Don't forget to attach the mylar re-enforcement panels (panels H-r and H-l) to the posterior of the sail prior to sewing. Mine somehow got separated from my pile-of-sail-panels and didn't get attached before the right half was sewn up. 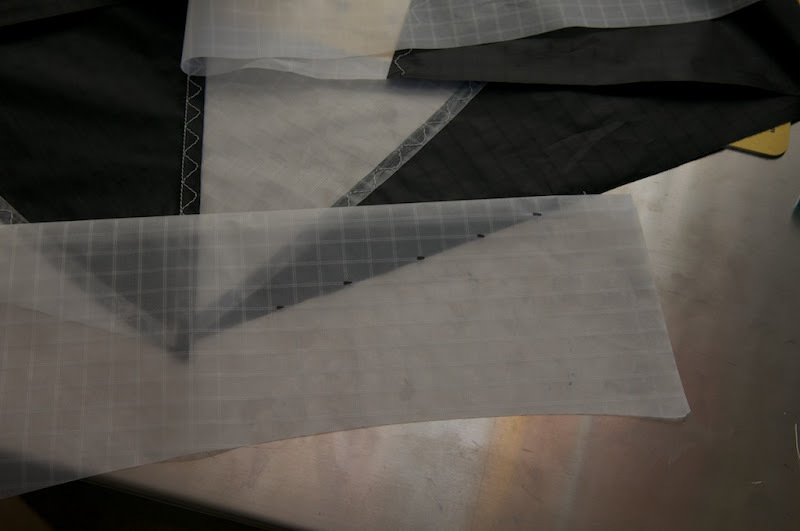 My preference would be to sew these with a single stitch that covered the sail and the mylar. 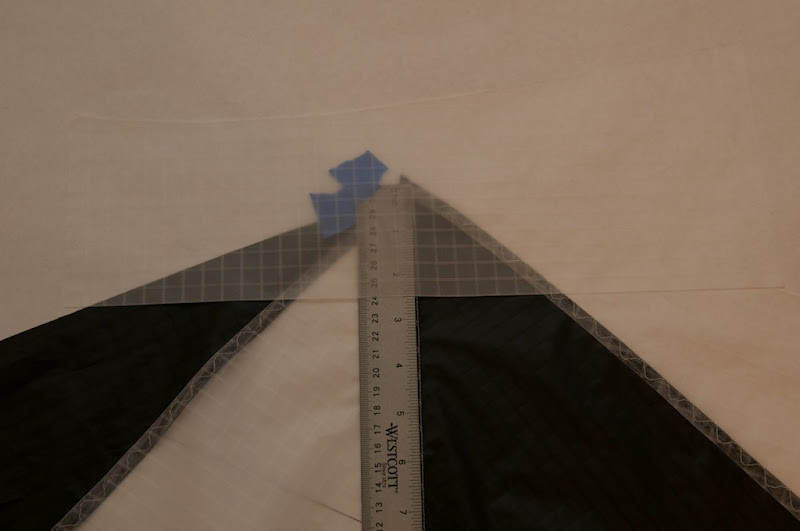 To fix this mistake (I may never be any less forgetful), I have sewn my re-enforcing panels on to the sail using a 2x2 zig zag stitch around the edge. 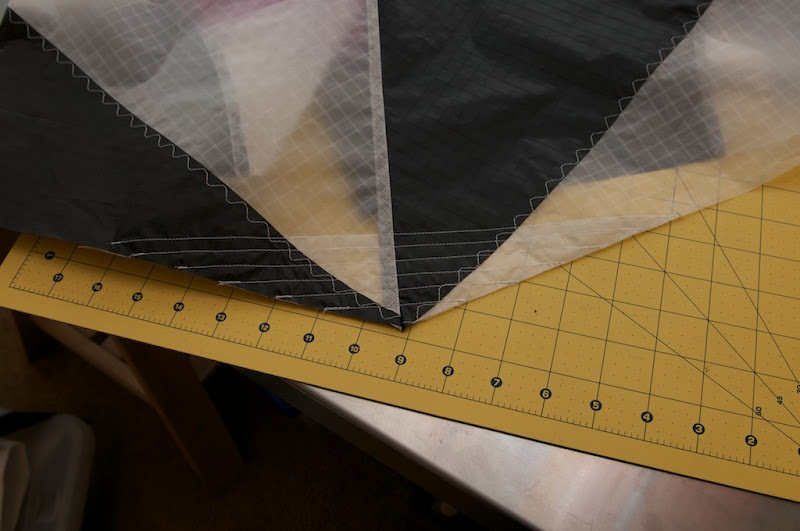 The mistake was caught before the left side of the kite went to the sewing machine, but because I love the equality of symmetry, I will attach the left mylar panel in the same manor... after sewing the seam with a serpentine stitch. Photos of the added mylar panels have been added to reply #17 of this thread. Ok, so you've sewn the right side of the sail (after gluing of course). Now on to the left. I'm not going to say much about the left except to mention again (I believe I said this earlier) that the left side will be glued over the plan in the same manor, only now we are looking at the back of the kite... so dark colors should lay beneath light colors. For symmetrical color patterns this is no problem. Edit:as I think about this statement, I realize that symmetry has nothing to do with whether this comes up or not... it's more about the number of colors used in each half and how they're arranged, so everyone should pay attention here. end edit The trick with my color choice is where the billowed seams come into play. Because I chose to glue each half up in 3 sections (top/leading edge, middle billowed portion, tail area) it poses a problem when layering colored panels. To avoid problems, I left the ends (last 1 cm) of seams unglued. It's difficult to see in this picture, but it should be noted that the hi-lighted seam has a portion in which I had to slide fabric between two pieces. Boy if that makes sense to you, I could probably say just about anything. let me explain again with as much detail as possible. remember our reference plan for panels... here it is again so you don't have to scroll back and forth. 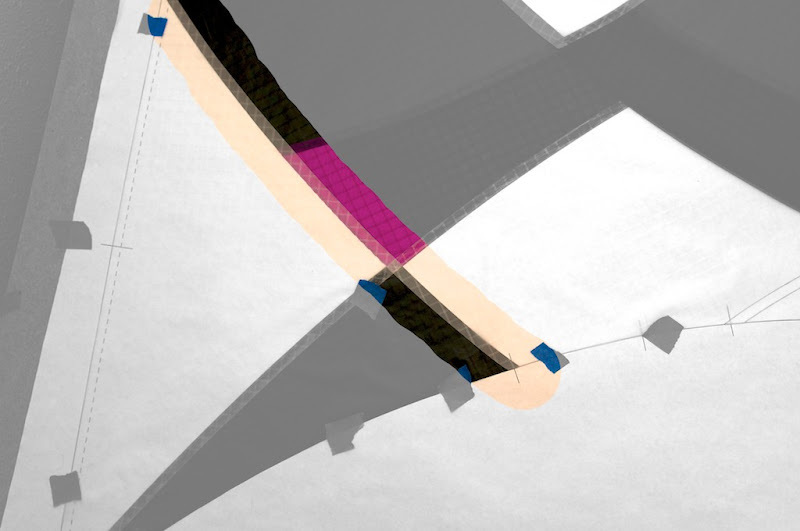 If you recall, for the last step, we are attaching the billow section (panels A, D and H) to the tail section (panels C and G). if you look at the color pic here, you'll see that panel C is white, and needs to end up at the back of the kite when complete. Because this is the left side, the white should go on top. Same deal for panel H. (still with me?). Because I already glued panels C and G together, I needed to leave a small amount where the seam ends (at the inner portion of the kite... not at the very tail) so that I could slide the billow section between them. 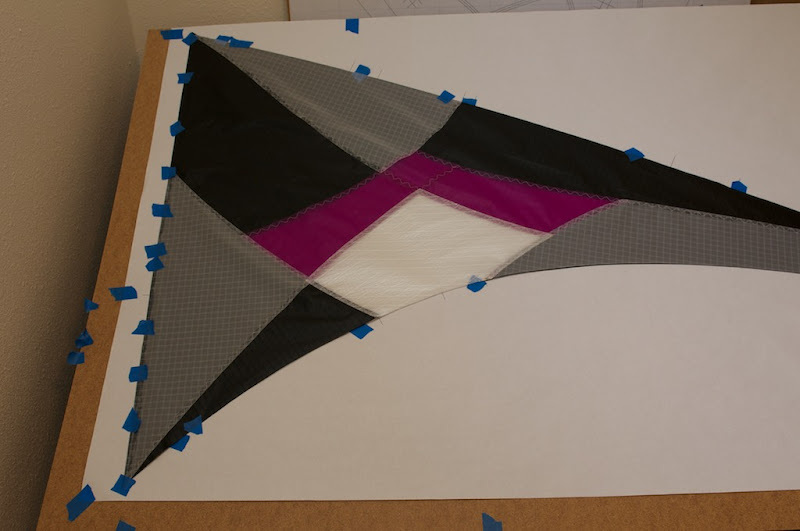 This way, both white panels end up in the back of the kite, and all the proper colors end up in the front. So, another way to explain. when looking at the corner that is shared by panels C, D, H and G, panel G is on the bottom (the very front). Next (moving upward/toward the back of the kite) is panel D, then panel H, then panel C.
My hope is to be as clear as possible so this technique is understood. I don't know any better way of describing in words how this is done. 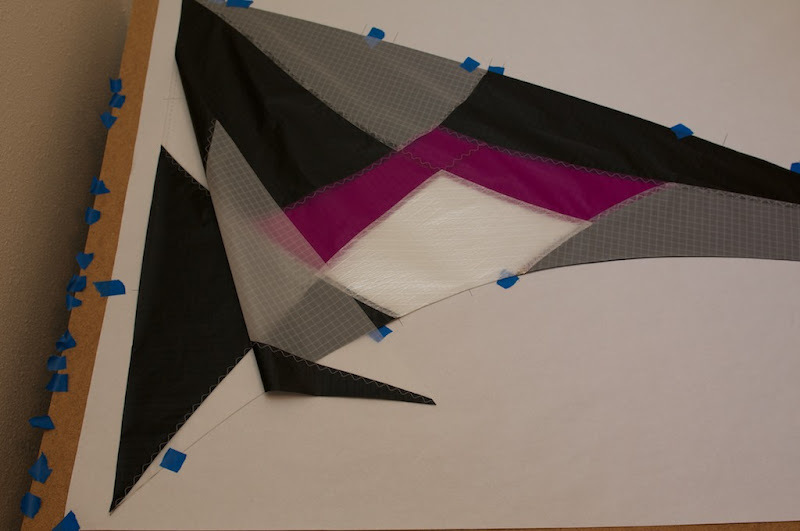 If you are an experienced kite builder, you may already know how to do this and I apologize for sounding patronizing. Let's move on. so, as this project progresses, you may notice that my documentation is sometimes playing catch-up to reality. I stumbled on some pictures today and realize that if you are using this thread as a guide to build your own B'zar you might be stuck(might I emphasize that this is not a great choice... this thread should be treated more as a "for your information" type document. While offering what I believe to be some excellent tips and a record of an actual kite build, due to the chaotic nature of my brain and documentation style, you should probably wait 'til the thread is complete and read the entire thing before trying to apply what you've learned. I digress). Where you ask might you be stuck? 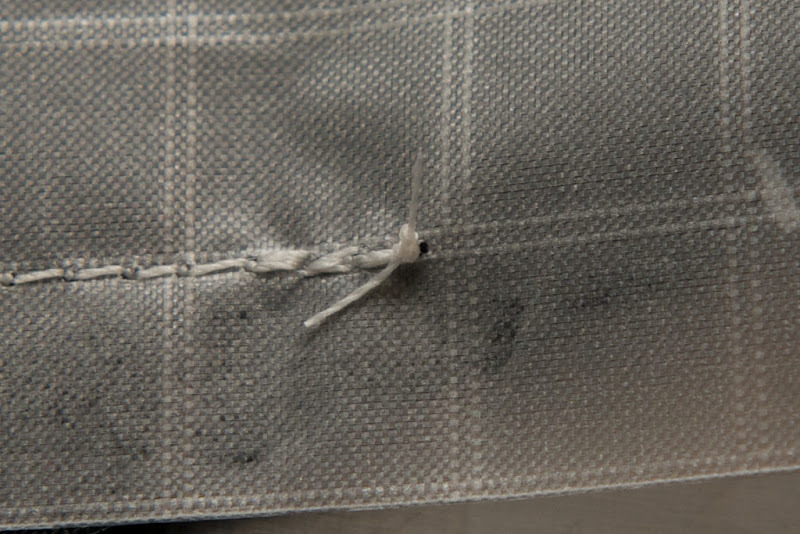 well, if you've avoided the small, minuscule mistakes that I have made, and managed to start sewing your sail... you may have a bunch of seams with loose threads at the end. 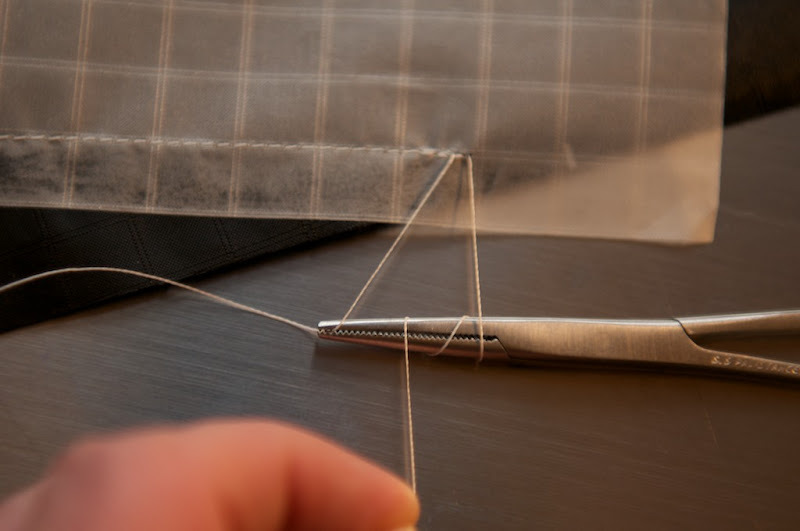 This post will explain and show how I tie off my seams. *warning* this process involves fire which can burn you or your kite. This could result in a visit to my workplace (Emergency Room) or the equally infuriating ball of fire that once was your kite. Polyester ripstop of the variety I'm using tends to melt rather than burn. No matter, yours and your kite's safety are your responsibility. Consider yourself warned. So, you've sewn your first seam and you pull enough thread from the machine to leave significant dangly strands for tying off. You've cut them away from the machine as described. Now, you need to get both strands to the back of the kite so that the tie-off is out of sight. To do this, pull the back strand enough so the front strand pokes through, creating a small loop. See picture and note that it is a straight stitch for an example, but it works the same with your zig-zag or serpentine stitches. 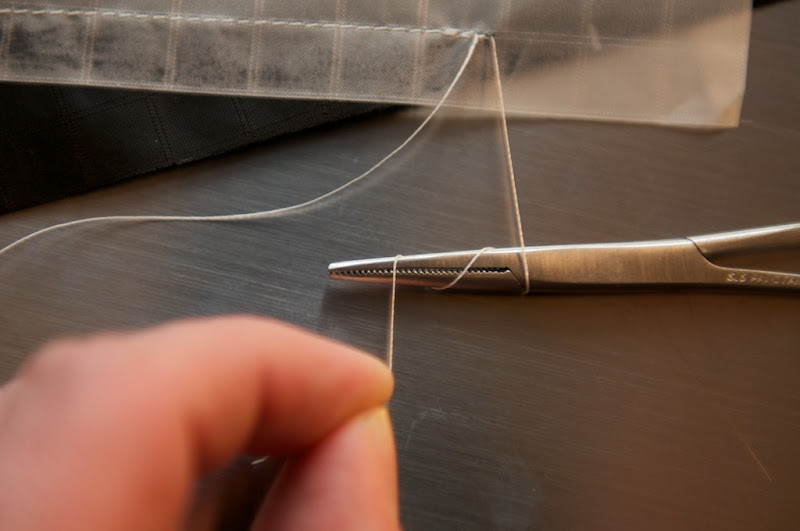 using the point of a seam ripper or needle, bring the loop all the way through so that now both strands or in the back of the sail. these examples show me using a hemostat (forceps, needle holder... whatever medical type needle nose pliers you may have) to tie a surgeon's knot... I almost never actually use the tool unless the strands are too small for me to manipulate with my fingers. They do however lend to better pictures and explanation. then, with the one strand looped around the tool (and holding the strand in place), use the mouth of the pliers to grab the loose strand. Now bring the loose end through the two loops. make sure the loose strand comes all the way through the loops before you pull it tight... it should look like an overhand knot at this point but with one extra wrap. now you can pull it tight. Before cutting the strands, I repeat this process for a total of 3 knots. 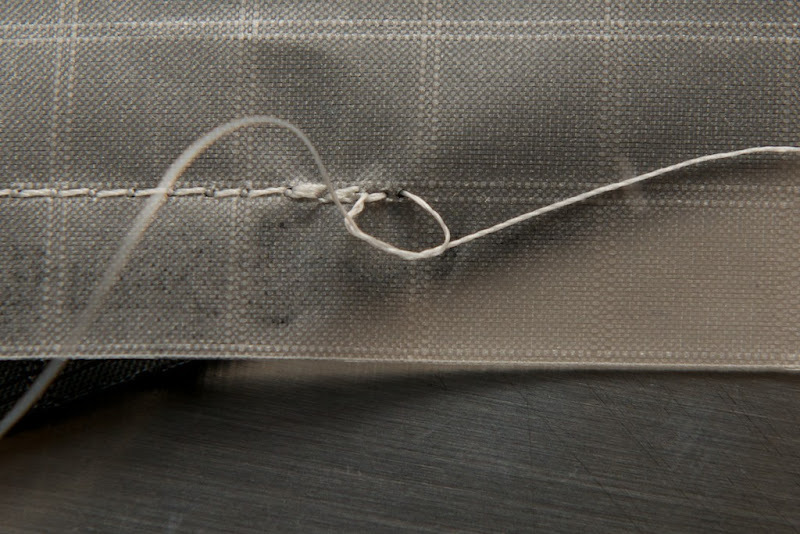 To be really specific, I alternate the directions of the loops between each knot; this is how an actual surgeon ties off sutures and it works for them so... I then cut the loose strands short and melt the ends with a lighter. You can hold the flame close to the kite without igniting the polyester, but know that you can absolutely burn holes by doing this (especially if fabric goes above/over the flame). I can't picture this technique without an extra person (or because I'm too lazy to set up a tripod with a timer). You don't have to melt the ends, but I prefer the cleaner look, and it will be less prone to coming untied. alright... tomorrow I'll move on to sewing the spine. Great thread and I don't want to mess with your flow, but to keep heat or flame away from your sail you can use just a dab of super glue on those knots before trimming to keep them from ever coming undone. I just tye one knot as described then the Super Glue I have comes in a bottle with a brush applicator, just touch the knot, let dry and trim. I'm glad for the suggestion. My sail is pretty much stitched at this point (documentation lags behind). I'll give the superglue method a try on my next build... I like how clean the knots are when I melt them down, but always get nervous having the flame so close to the sail! Thanks for the input. The next step, now that the individual halves are sewn, is to attach them at the spine. The B'zar has a curved spine. You may have noticed at this point that the edge of the plan that represents the spine is not straight. This is not a new concept, as Chris Derefat has been incorporating it in his designs for a while now (Quartz, Organic, Vortex etc.). The curved spine helps tension and shape the sail without creating folds or wrinkles, and helps take up any unintended extra material that might form a "dent at the upper spreader" according to the B'zar website. 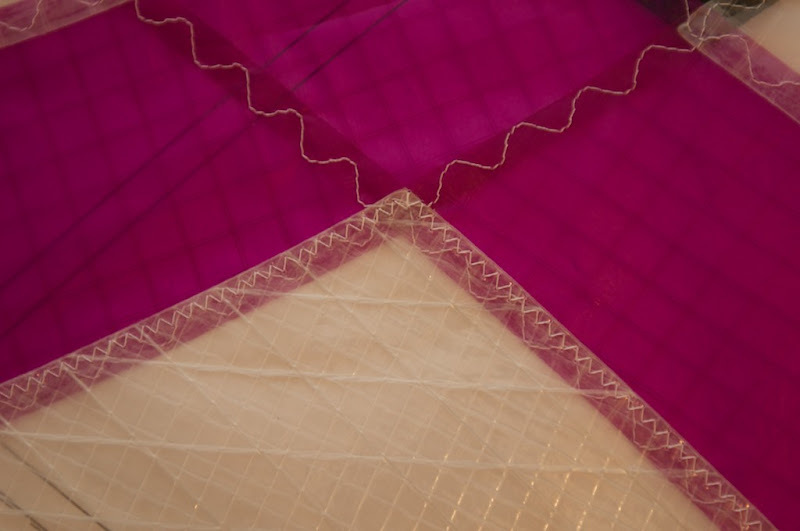 The traditional/common way of attaching the halves of a kite together has been to have an overlapping seam identical to the other seams on the sail... using a zig-zag or serpentine stitch. For this build (and other's I've done) we're going to do something a little different to ensure that the seam is smooth and even. Then glue the spine together and tape for drying. I use the same gluestick I've been using, and place glue in a strip approximately 8mm wide at the edge. Sewing machine setup is important when stitching the spine. 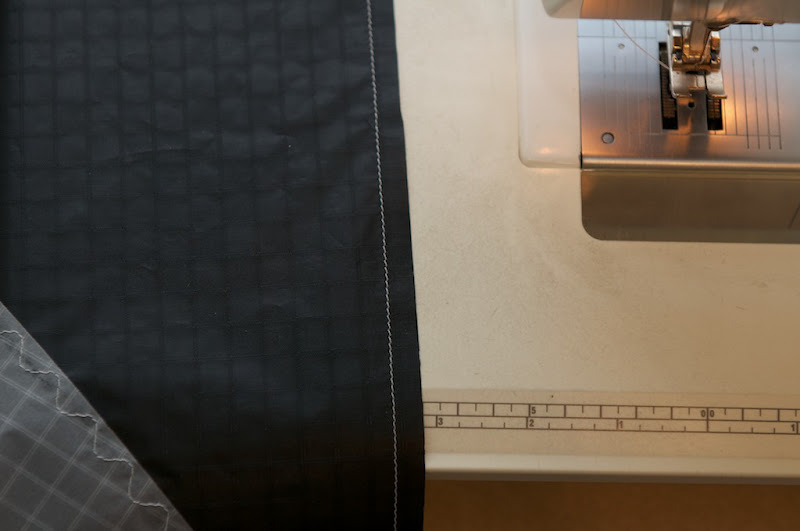 You should either have a guide you can place on your machine; at least a visual guide should be used in order to maintain a stitch exactly 8mm from the edge of the fabric. I'm lucy that from the center of my needle to the edge of the standard foot on my Bernina it is exactly 8mm. Stitch the seam using a straight stitch. I chose the default 2.5mm for my stitch length. Now that you've attached the halves at the spine, you need to reinforce the straight stitch. Do this by opening the kite up and folding the flap of the spine to one side or the other and sew it down using a serpentine or 3 step zig-zag stitch. Remember that the straight stitch is the actual center of the kite and the serpentine stitch will be to one side when complete. It is important to remember that for measuring later in the build. 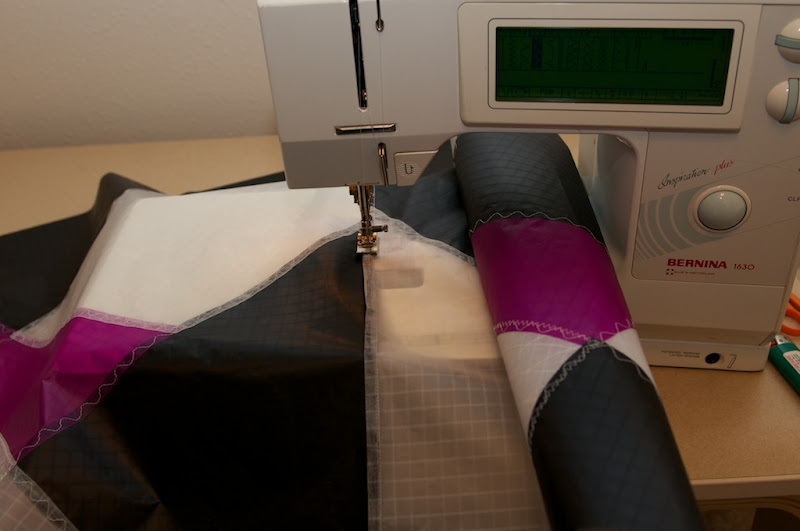 When sewing the flap of the spine down, I roll the half of the kite that will fit in the arm of the sewing machine so the fabric keeps from wrinkling or causing an error in my stitching. Now that the spine is sewn together, it's beginning to look like a kite! A couple other things you can try to melt the knots other than a lighter is a solder iron on high with a flat point. If you want to flame it then the method I use is to lay the material on your table, take some damp papertowels to lay around the knot and use a small butane pencil torch. THe pencil torch melts the knot faster than a regular lighter and the damp paper towels keep the heat from damaging the material. I use a different method to sew the two wings: I draw a line on the plan (if it doesn't exist already) outside and along the spine at 4mm from the edge of the wing, then I slide the right wing aligning it to this line, the left wing will be aligned at the dotted line of the center panels so it will be at 4mm from the spine. So doing the two half of the kite will overlap 8mm as all the panels are. Then I glue them till center T and let dry, then I mark some dots at 8mm from the edge on the under wing and finish to glue the bottom part of the spine from center T to tail. Now I simply sew the assembled wings with a three points zigzag. 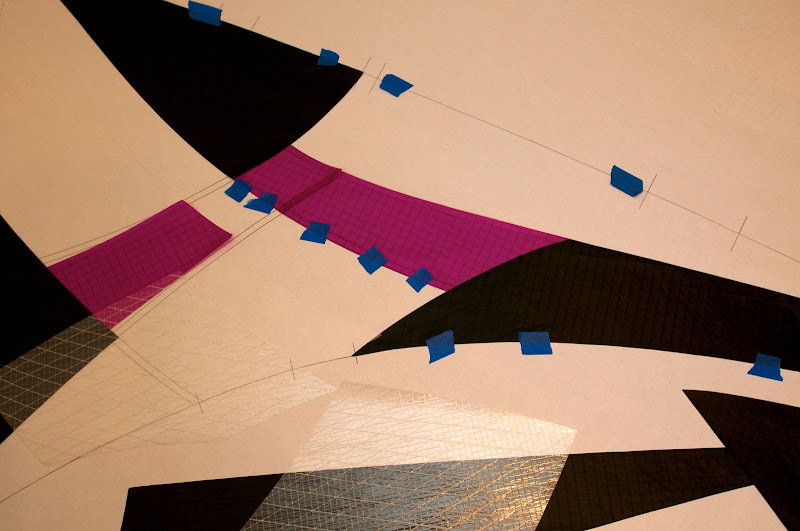 @ Svolazo: the method Sugarbaker is using is the way to go on a kite as complicated as the B'zar 2011 Std. sail is sewn into one whole piece. good. there are some things that have to happen before we attach the leading and trailing edges. Because I want to have the edges be the most outward layer (with the exception of the finished nose, but that is another post... or two) some reinforcing needs to be done prior to sewing on these parts. The flow of construction should be done from the inside out (at least that's how I think of it in my head). So, the next step for me is to reinforce the nose. 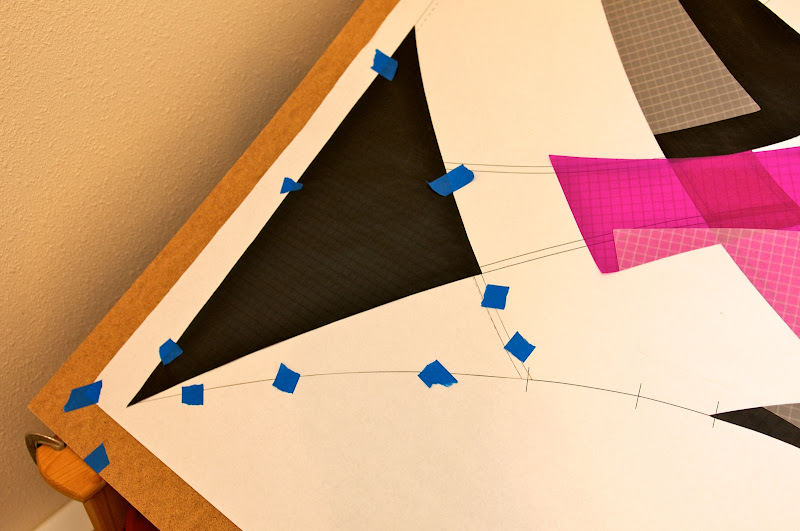 There are a number of options/paths you can take to build up the nose on your kite. Some use a panel of mylar. My preference is to use an additional layer of PC31. It serves the purpose of adding additional strength to the nose area, but I find that I like the flexibility of the material. At the nose, the fabric will have considerable amount of curve when complete and I like it to not get heavy creases in it as I've seen happen with mylar nose panels. To start, I mark the center seam on the kite at a few places... approximately 1cm down from the tip and 6cm down from the tip on the back side of the kite. I then dig through my box of scrap fabric and find a piece of PC31 that will fit across the nose... it has to be long enough to cover the 6cm mark by about 1 extra cm, and wide enough that it covers the nose all the way across both leading edges. I found that a rectangular piece about 4 inches tall and approximately 12 inches wide will satisfy this requirement. 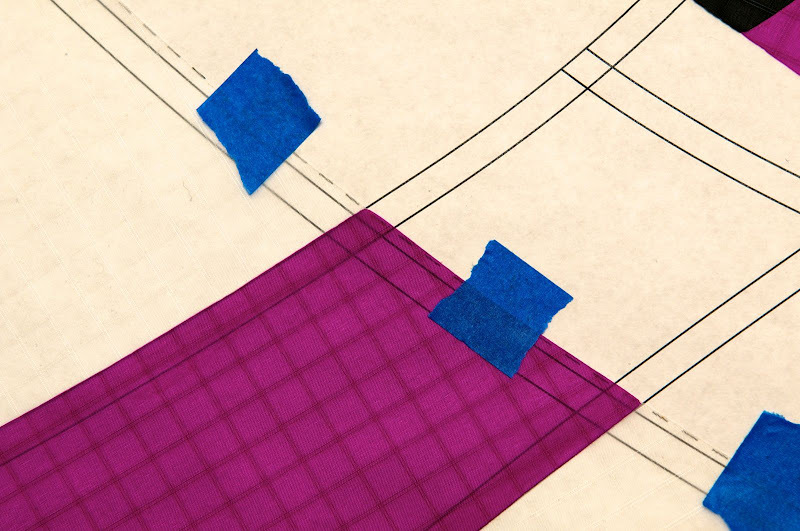 I square off the lower edge of the scrap so that the bias runs in line with the center seam. I chose the color white so the panel would not be seen from the front of the kite. If you have another color at the nose of your sail, either choose white, or the same color as the sail at this point. Next, using a straightedge and running it perpendicular to the seam at the 6cm mark I just made, I find the point on both leading edges where the straightedge crosses at equal lengths from the nose. I found this to be at 18cm down the leading edge. I mark this point on both leading edges so that I will have my nose reinforcing panel lined up properly when I glue/sew it in place. Now with the sail properly marked, I glue the nose panel in place... pointing towards the tail. "hmm... towards the tail" you may be thinking. 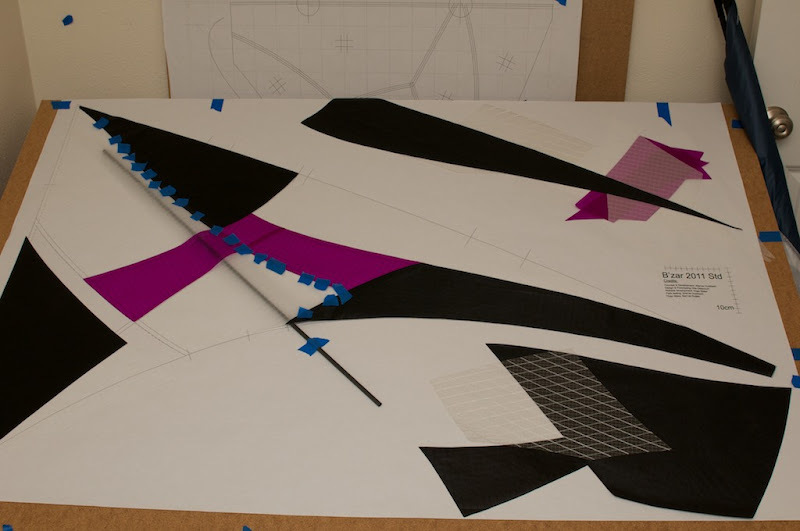 I line up the first line of the bias over the two leading edge marks and glue to the kite as pictured. You'll see why in a minute. 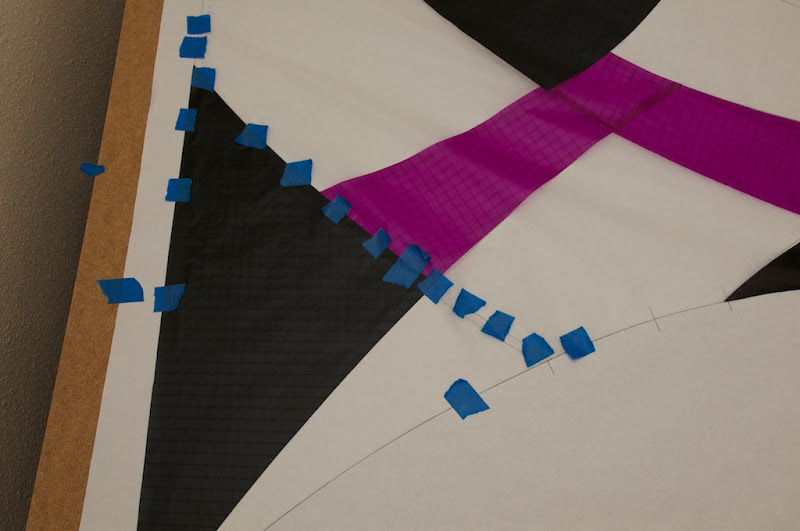 sew the panel in place using the bias as a guide (and still aligned towards the tail at this point). 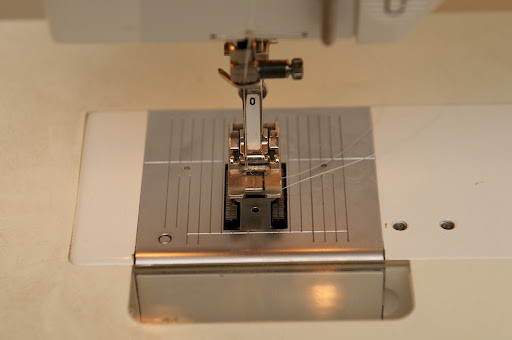 I use the default straight stitch setting on my machine, which is a length of 2.5. After I make this stitch, I fold the panel up towards the nose. This will hide the bare edge of the panel and have a cleaner look when the kite is complete. After folding the panel toward the nose, I mark each of the lines of bias that I will stitch to keep the panel in place. 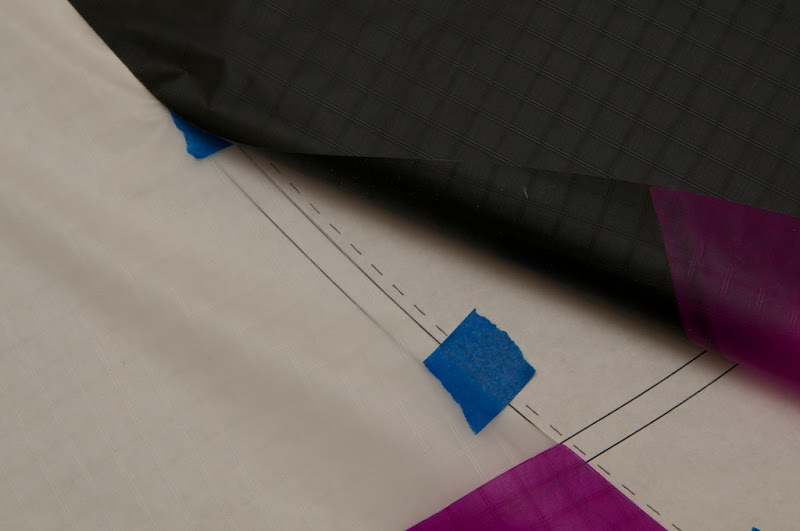 I use a black sharpie, as it's easy to see these marks when I am lining up the fabric to sew. Once I've sewn my seams (lined up with the bias, or 1 cm apart) running up the nose, I have a lot of extra material. When I cut it off, my choice is to hot cut it. I also remove the tab at the nose that was created when I made the seam for the spine... which was folded over and left some material sticking out. I cut off the excess material with a hot cutter and a metal straight edge. Coming up... before the trailing and leading edges, I'll show how I protect the spine/center seam of my kites. It's pretty straight forward, but there are some small details I want to mention that I've found to be beneficial when building.